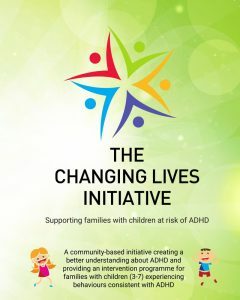 The Changing Lives Initiative is a community-based project creating a better understanding about ADHD and providing an intervention programme for families with children (3-7) experiencing behaviours consistent with ADHD. The Initiative is a cross border project operating in County Louth, West Belfast and the Argyll & Bute Region. The project is supported by the European Union’s INTERREG VA Programme, managed by the Special EU Programmes Body (SEUPB). The Changing Lives Initiative offers a programme for families of children aged 3-7 consisting of an information and awareness programme, a screening programme, and an intervention programme. The Parent Information and Awareness sessions are the first phase of the programme and are run in schools, libraries and other suitable venues. After attending a Parent Information and Awareness session, parents who are concerned that their child might be experiencing behaviour consistent with ADHD, can choose to take part in our Screening Programme. 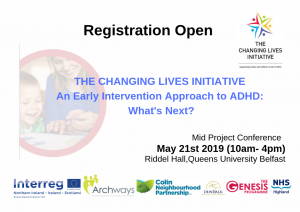 If the screening results indicate that a family meet the criteria for our programme, that is they have a child who is experiencing behaviour consistent with ADHD, they will be offered a place on The Changing Lives Initiative Parent Intervention Programme. For more information on each aspect of the Initiative, please see the For Families menu item above. As well as working with families, The Changing Lives Initiative provides training for those working with young children, in particular teachers and early years’ professionals. Our two module Professional Information and Awareness session is provided by The Changing Lives’ Psychologist. For more information on Teacher and Early Years Practitioner Information and Awareness sessions, please see the For Professionals menu item above. A project supported by the European Union’s INTERREG VA Programme, managed by the Special EU Programmes Body (SEUPB). Tel: 028 96 919960 (please always dial area code.